Determined to enjoy her imminent retirement, Adele invites her fellow bibliophiles to help her house-sit in the Blue Mountains. It’s a tantalising opportunity to spend a month walking in the fresh air, napping by the fire and, of course, reading and talking about books. But these aren’t just any books: each member has been asked to choose a book which will teach the others more about her. And with each woman facing a crossroads in her life, it turns out there’s a lot for them to learn, not just about their fellow book-clubbers, but also about themselves. Liz Byrski has written a beautiful novel about the joy and comfort reading a good book can bring to us all. The four women; Ros from Sydney, Adele from Adelaide, Judy from Mandurah near Perth, and Simone from Tasmania have had their weekly book club meetings via Skype, always online, never having met one another. The group had been larger but had dwindled over the years; the four were friends but in saying that, hardly knew one another. When a friend of Adele’s asked her to house-sit in the Blue Mountains – take some friends if she wanted – Adele immediately thought of the book club ladies. Her trepidation at sending the email to them all was unwarranted, as all three gave a resoundingly positive yes! Each member was to choose a book that had meaning to them; to bring four copies and when it was that person’s turn, hand out the copy leaving a week to read it. Then come Sunday, it was discussion time. As the days moved forward, in among the brisk walks in the sunshine; the sharing of the beauty of the area; and of course, the joy of having Ros’ dog Clooney to fuss over – everyone realized that these women in their sixties and seventies, had a past which had affected their current lives, and themselves. They were at the stage of needing to learn why they were as they were, and whether it was possible to let the past remain in the past – to make peace with it. Would those very special books, chosen with love by the four book club women, help in defining them? And would four women, previously unknown to each other, other than an online presence, manage to get on for four weeks in the same house? 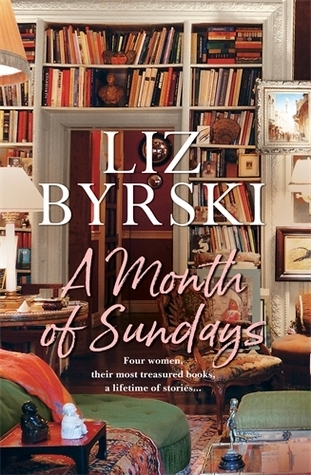 A Month of Sundays by Aussie author Liz Byrski is an exceptional, emotional and brilliant read! I can’t fault the writing, the story, the fabulous women – and of course being about books, I’m going to look up each and every book they read for their book club get together each Sunday (and I won’t say what they are here as it’ll spoil the element of surprise for a new reader). I want to be taught yoga by Simone – I identified so much with Adele – I felt a deep empathy for Ros; and loved Clooney – and wanted to give Judy a big hug. Such an excellent read – Ms Byrski doesn’t disappoint. Highly recommended – 5 stars. With thanks to Pan Macmillan AU for my uncorrected proof ARC to read and review. This entry was posted in Book supplied by publisher or author for review, Contemporary Fiction, Guest Reviewer, Life Lit, Post Script: Book Reviews and tagged #Brenda, 5 star read, Allen & Unwin Australia, BOOKS, reading. Bookmark the permalink.